This summer, as part of the Walker’s Field Office program at Open Field, myself and Colin Kloecker from the art/design collective Works Progress are partnering with Walker ECP staff and 8 creative researchers to produce a series of experimental public art projects. The projects will range from installations to workshops to participatory interventions, and will take place both on the Open Field and elsewhere throughout the twin cities. Each Field Office Fellow will explore different questions and themes related to public participation/public space, and the will return to FlatPak after their project is complete for an informal public conversation on what was learned. The 8 Field Office Fellows come from a range of creative backgrounds and practices, including participatory art, community planning & design, architecture, organizing and activism. Each Field Office Fellow will be creating a small project that explores questions relevant to their own creative practice, and that provokes expanded thinking of what public practice can be and do in the twin cities. Field Office Fellows include artist and Mayor of Mt.Holly, MN, Mike Haeg; Amoke Kubat, artist & founder of Yo Mama! 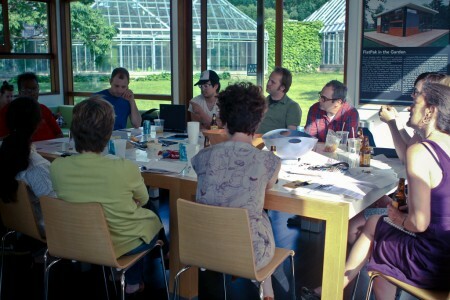 The Mothering Mothers Institute; landscape design/architecture researcher & artist Virajita Singh; artist & new media professor John Kim; artist Ben Garthus; artist & on the commons associate Rachel Breen; poet & publisher of Coffee House Press, Chris Fischbach; and Christian Dean & Bob Ganser, designers with City Desk Studio. We’ll be blogging about each of these 9 fellows and their projects here, so stay tuned! There will be plenty of opportunities for public participation in the projects themselves, as well as in the Field Office conversations that follow.